Home » TRX Workout Plans » What is TRX Suspension Training? TRX Suspension Training gives you everything you need to build a better body at home – or on the go. TRX Trainer is the most sought-after fitness equipment of the past years. 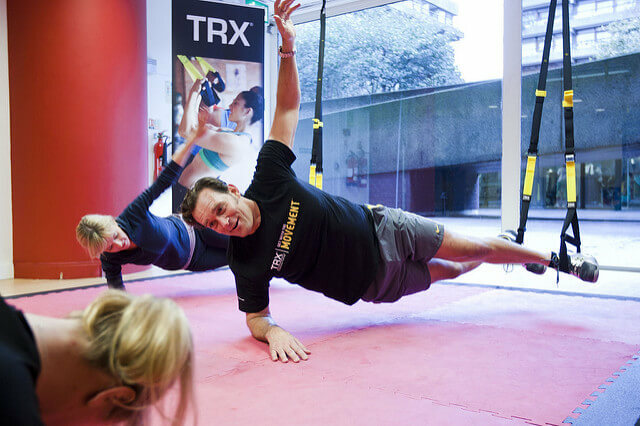 TRX is an inherent part of every functional zone in modern fitness facilities and a perfect solution for every trainer and coach. When visiting a gym or a fitness facility, you are likely to find a number of large exercise machines and weights there, each designed for one particular muscle in the body. TRX Training = over 300 exercises. However, it may be no exception that you will find a line of people waiting for their turn at every machine. TRX saves your time that you normally waste looking for a suitable exercise machine. 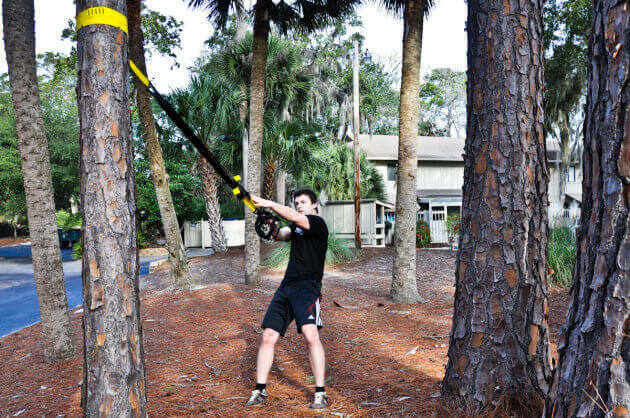 TRX Suspension Trainer: Efficient product for your functional training anywhere around the world. Not all athletes are thrilled to use static exercise machines. Others find traveling to facilities and back home in rush hours a perfect waste of time. There are a lot of trainers searching and developing methods for their athletes to improve fitness safely and quickly in their sports venues without having to travel. Where does TRX come from? How effective is TRX Training and does it really work? 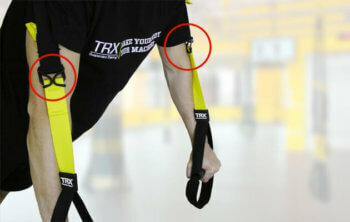 Concept of the TRX Suspension trainer: Body perceives movements, not muscles. This concept is absolutely different from traditional workout conducted on exercise machines focused on sole, isolated muscles. It is based on a combined approach that includes balance, coordination and flexibility. Workout exercises performed in static positions may work well if you wish to increase the size of any muscle group, but they do not require satisfactory neuromuscular coordination which is necessary when setting optimal workout plan and optimal performance. Suspension training techniques have been designed to utilize the whole of your body as a single coordinated system. TRX Suspension Training is a great development step in functional training. Suspension training exercises allow motion in three dimensions which is impossible to achieve with any other fitness equipment. You can concentrate on specific target area in every athlete or client by making little changes in their body positions. Doing so, you can customize your approach when pushing people’s physical limits. With TRX system, you are in control of how intense your training is by adjusting your body position to add or decrease resistance. TRX Kit includes two adjustable TRX Suspension Trainer straps with handles for your hands or feet. Workout always requires that one part of the body is positioned on the ground or a matt and the other is suspended in TRX. 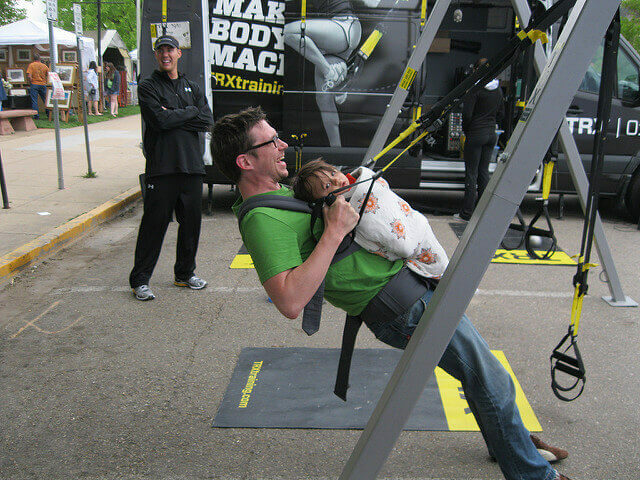 TRX is portable and can be set up anywhere. It provides more functionality and performance than any of the large exercise machine costing thousands of dollars. TRX installation instructions – How capture TRX? Every workout challenges body core – i.e. abdomen, abs, back, chest, and pelvis area. Core training helps your body keep stability and stay flexible. No matter what activity you engage in on a daily basis, it will always have an impact on your core – whether it is washing your car, playing basketball with children, doing sports for fun (golf, tennis, etc. ), or getting ready for a real competition. When you buy from TRXtraining.com, you can rest assured that you’re getting genuine, best-in-class TRX products that withstand heavy daily use by some of the world’s most demanding users like NFL football teams, top health clubs, and elite military units to name a few. The ORIGINAL TRX you can also buy on Amazon. The price can be lower, because on Amazon there are still older versions of the TRX Suspension Trainer (TRX models manufactured 2016 – 2017). Just be sure you shop a product from a seller named “TRX”. 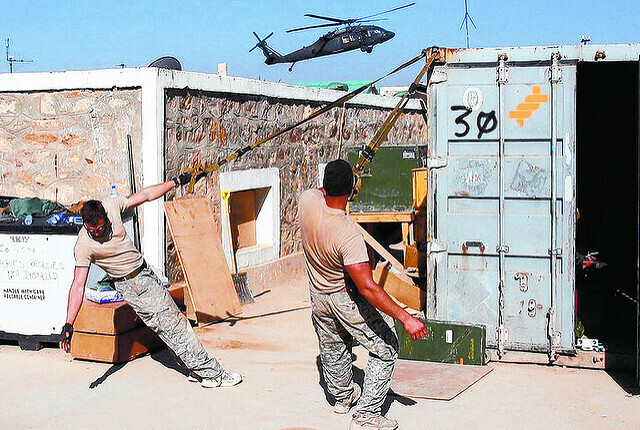 TRX was originally invented by the American military that needed a versatile full-body workout system working even in extreme conditions. TRX and its workouts can easily replace a fully-equipped fitness facility. Gradually, TRX has found its way to locker rooms of the best MMA fighters, many Olympic medallists, and dozens of other professional athletes from around the world. Suspension training gives participants an edge over pure protocol conventional strength training. This exercise builds true functional strength training and improves flexibility, balance and core stability all at once, which is required on the playing fields of sport and in life. TRX Suspension Training is beneficial and relevant not only for elite professionals; such exercise is important for anyone who seeks a method to safely and rapidly improve his or her fitness. Personal trainers have soon embraced the suspension training and TRX group courses have become a great success in many countries throughout the world. Celebrity fitness trainers use TRX Suspension Training regularly with their clients and they achieve amazing results. Wellness centres enjoy incorporating TRX in their programs for senior citizens because this type of exercise enables seniors to move freely without fear of falling. Physical therapists are using TRX exercises to rehabilitate patients in hospital wellness centres, sports medicine clinics and chiropractic offices. Clinical studies are being carried out at the moment to generate best practice to be used in treating various common orthopaedic and sports injuries. What fundamentally distinguishes suspension training exercise as a modern exercise genre, is the systematic collection of best practices, both old and new, to be produced, modified and shaped into a coherent system with a single built exercise methodology. Its uniqueness also lies in the invention of TRX Suspension Training, the first exercise equipment in the world for performance workout that allows a wide variety of fitness exercises for the whole body. TRX, imaginative patented elements, improved over the years, are optimal for the human body. TRX allows for a wide range of suspension techniques that can be performed anywhere, anytime and by anyone. In its simplest form, the suspension training covers a wide range of body movements, teaching guidelines and program policies, of which Fitness Anywhere created a system. Suspension training movements are distinguished from traditional exercises in that either the user’s hands or feet are generally supported by a single anchor point while the opposite end of the body is in contact with the ground. Using TRX, desired percentage of the body weight is loaded in a certain target point and set in motion during exercise. A single anchor point provides an ideal combination of support and mobility while working out and training endurance, coordination, flexibility, strength and stability of the body all at once using a variety of steady-state training. The TRX Suspension trainer employs gravity and movement to generate neuromuscular responses to changes in body position and mechanical advantage. If the body is in straps anchored in a single point over its head, its center of gravity seeks the lowest point on the ground. For example, when hanging on horizontal bar with both hands, our center of gravity is pushing us towards the floor. Once you hang just with one of your hands, your body will tilt and rotate so that your centre of gravity again stabilizes in the lowest midpoint. Movements using the TRX integrate strength and balance into a single dynamic format, which imposes a heavy burden on the nervous system, and maximizes the benefits of body weight exercise for faster results.